I still have a lot to learn when it comes to couponing. One of the most important things I need to improve on is reading and understanding advertisements in the weekly circulars. I saw that Safeway was offering Cheerios for $1.49 a box and there were $1 off one box of Cheerios available for print on the Internet which would make each box only $0.49. The advertisement said that in order to get the $1.49 price you needed to buy 4 boxes. My mistake was assuming that the “buy 4 boxes” meant that I had to but a minimum of 4 boxes and not in sets of 4 boxes. 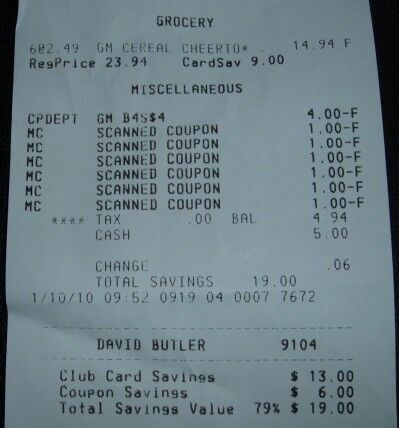 I went through my check-out line and all the coupons were added up and the cost came to $4.96 for the six boxes of Cheerios, or a 79% savings. The cashier actually complemented me on getting such a good deal, but I was perplexed as I expected the final price to be $2.96, or $2.00 less than the amount I was charged. After looking at the receipt closely, I saw that I got the $1.49 price for 4 of the boxes, but was charged $2.49 for the other 2 boxes, and that was when I understood the mistake I had made. Usually I would mark the $2.00 down to a learning experience and be more careful, but Penny Experiment has changed the way I look at money quite a bit. Instead of “being just a couple of bucks,” I know that the couponers can get about $20.00 worth of food for the food banks with only $2.00 making my mistake a lot more costly. I decided to go to customer service and explain the situation. I planned on giving back the 2 boxes which cost $2.49, but after looking at the advertisement, the customer service representative decided to let me keep the 2 boxes and refunded me $2.00 meaning that I only paid $2.96 for the six boxes. 1. Know beforehand what you believe you should pay for the items you are going to buy. If I hadn’t expected to only pay $2.96, I probably would have never noticed that I was charged more for the 2 boxes. 2. Pay special attention the the wording of the offers in the grocery store sales circulars. If you assume one thing when it says something else, you may end up paying more that you anticipated. 3. It pays to go to customer service if something turns out differently than you expected. It would have been simple for me to walk off, but by explaining what happened, I have $2 more available for couponers which will mean about $20 more worth of food that goes to a local food bank. 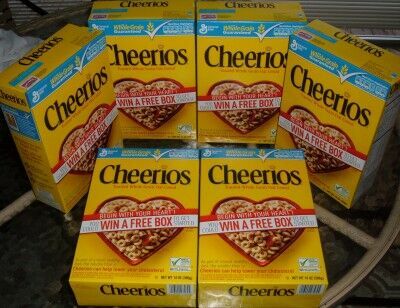 PS You can enter to win a free box of Cheerios at Begin With Cheerios, but you also will get 4 $1 coupons for entering. Use them for yourself of feel free to send them my way. 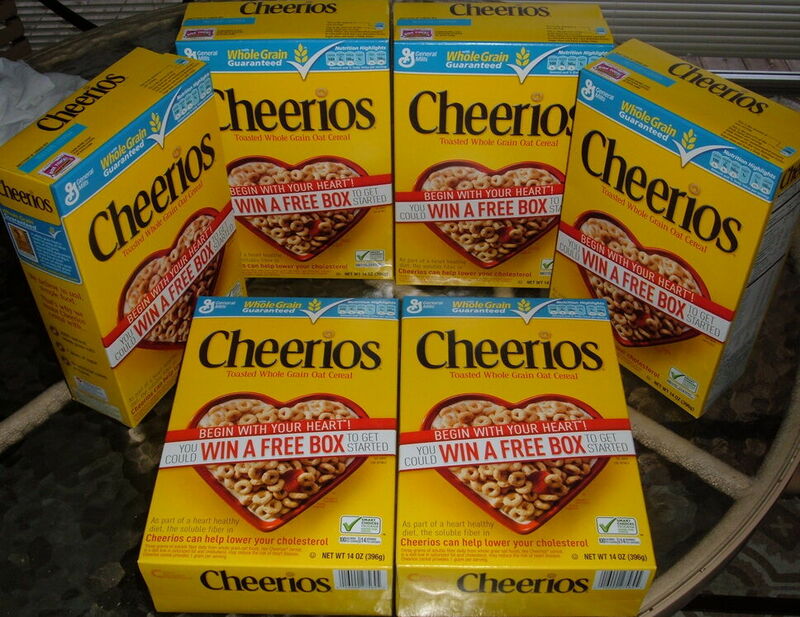 This entry was posted in Coupons, Donated Food, Penny Experiment and tagged buy 4 boxes, Cheerios, coupon circulars, coupon deals, coupon savings, couponing, Coupons, Safeway. Bookmark the permalink. Awesome job! Funny, we have one of those “you have to buy four boxes, no more – no less” deals here too! Always have to read the fine print! Keep up the great work.